We broke the cardinal rule of full time RVing. What rule is that, you ask? I’ll explain more about that in a bit…. On Thursday, we drove our Ford Escape from Lake Leelanau to visit Diana’s mom. We then continued on to Donaldson, Indiana to visit my aunt and uncle, whose birthdays were both this weekend. Aunt Marge is 91 and Uncle Ed is 89. Both are my mom’s siblings, and are doing well. 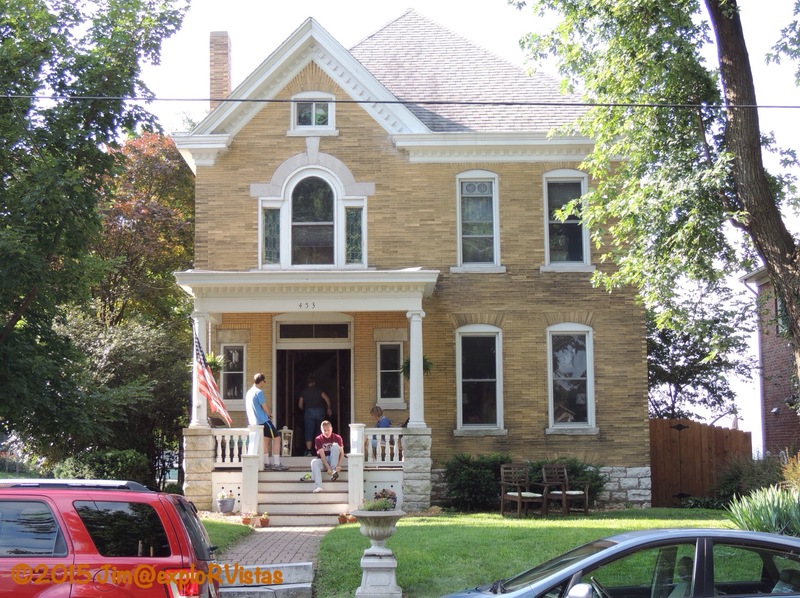 We stayed overnight, then headed to our friend’s house in Alton, Illinois the next day to spend the weekend with a total of four families of our college friends. 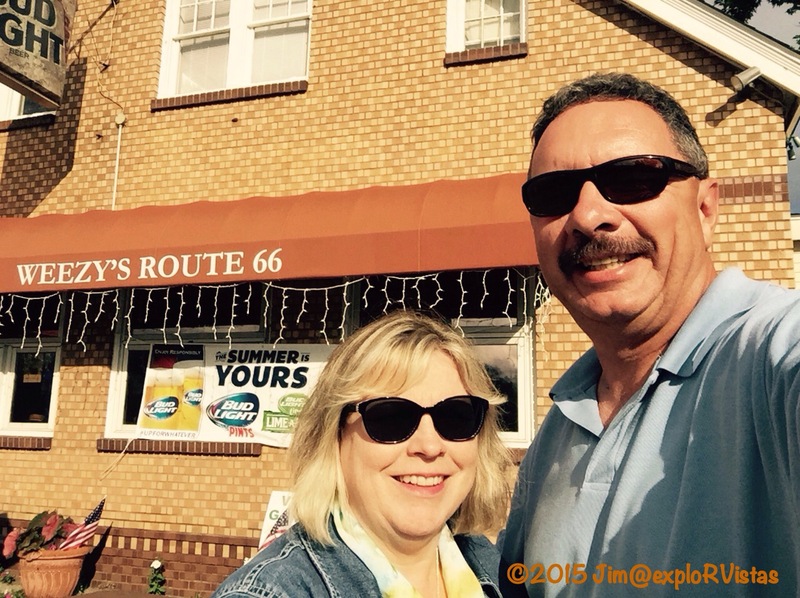 Along the way, we stopped for a photo at Weezy’s, an old Route 66 roadhouse that is alive and well. Illinois still has most of its portion of the famous highway intact, as it runs alongside Interstate 55. We ate at Weezy’s the last time we were through with our friends Mike and Cindy, and we couldn’t resist the photo op this go-around. We made it to Jim and Sue’s place by early evening. 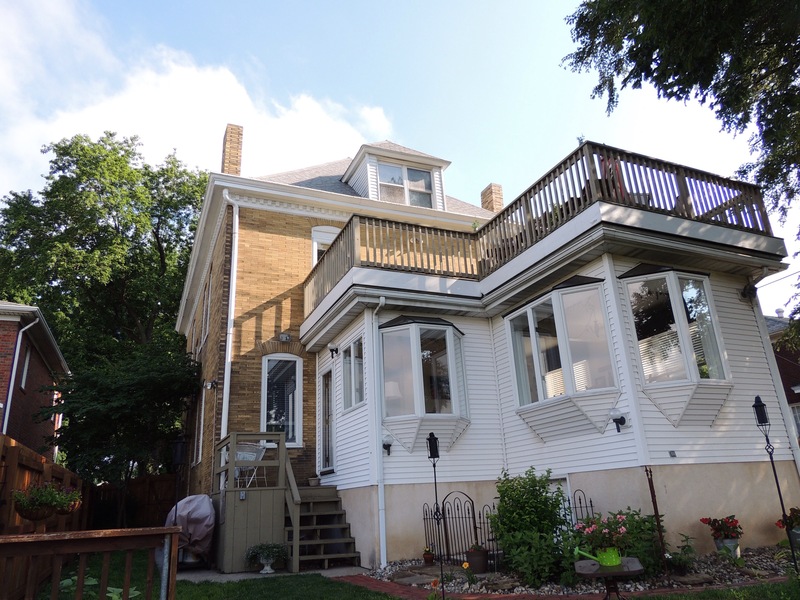 As you can see, they have a fabulous view of the Mississippi River from their deck. 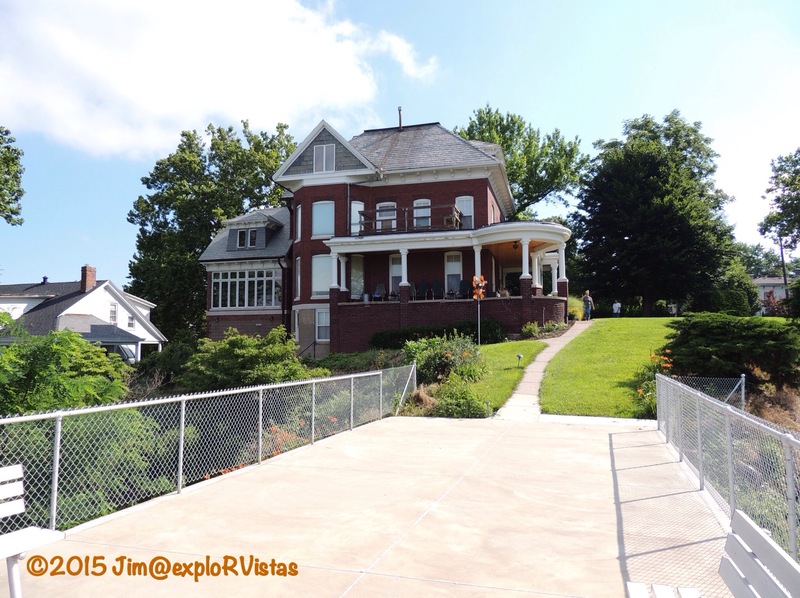 A few years ago, they purchased this stately, century old home which sits high on a bluff along the Mississippi. It was built for a riverboat captain, and is absolutely beautiful inside and out. They also have a great view from the front porch. Here is a closer view from the back deck. The building in the foreground is the Abbott Machine Works. Just beyond it is the Great River Road. 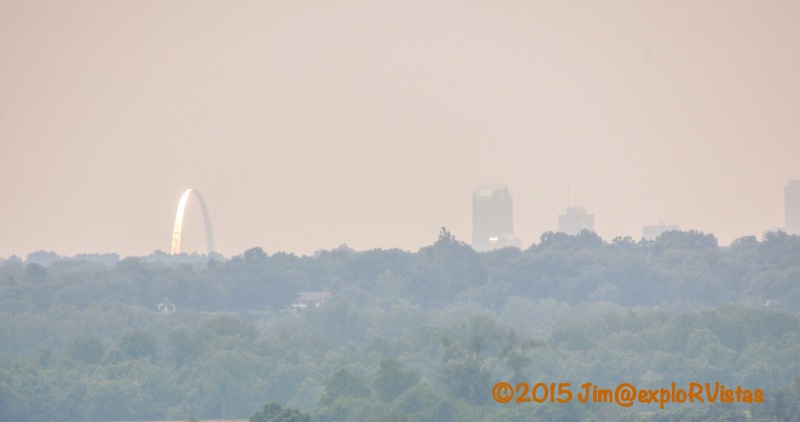 Pulling in the horizon with my telephoto lens reveals St. Louis and the Gateway Arch. Between Alton and St. Louis lies the Missouri River, as it converges with the Mississippi just south of Alton. The previous owners added this dining room, along with an upper deck. It really is a great place to entertain guests. 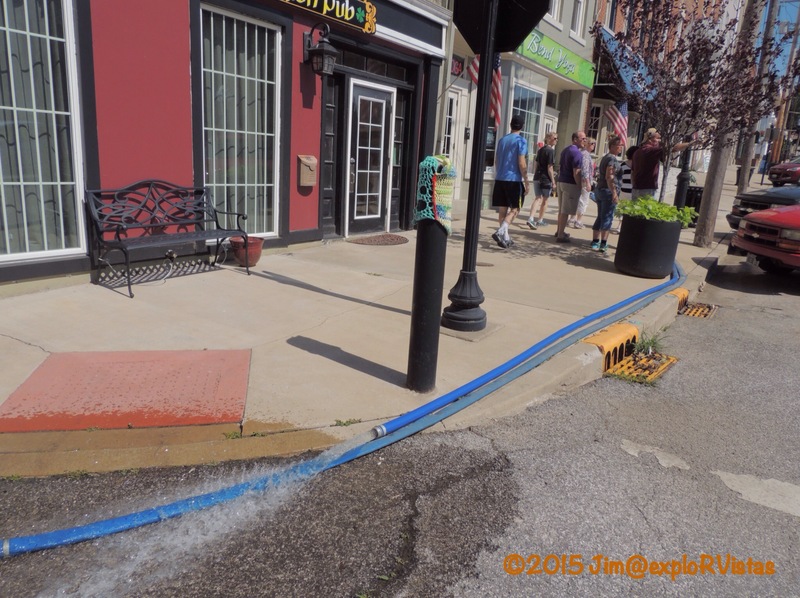 On Saturday morning, we decided to take a walk through their neighborhood and into downtown Alton. From the street, we were admiring this gorgeous home with a commanding view of the river, when the owners, Janet and Rich, walked out. We asked them if they would take a group photo for us when Rich said “Why don’t we take it on the point?” The point he was referring to was a huge concrete patio/pedestal of theirs that jutted out from the bluff. Very nice, indeed. Thank you, Rich and Janet! 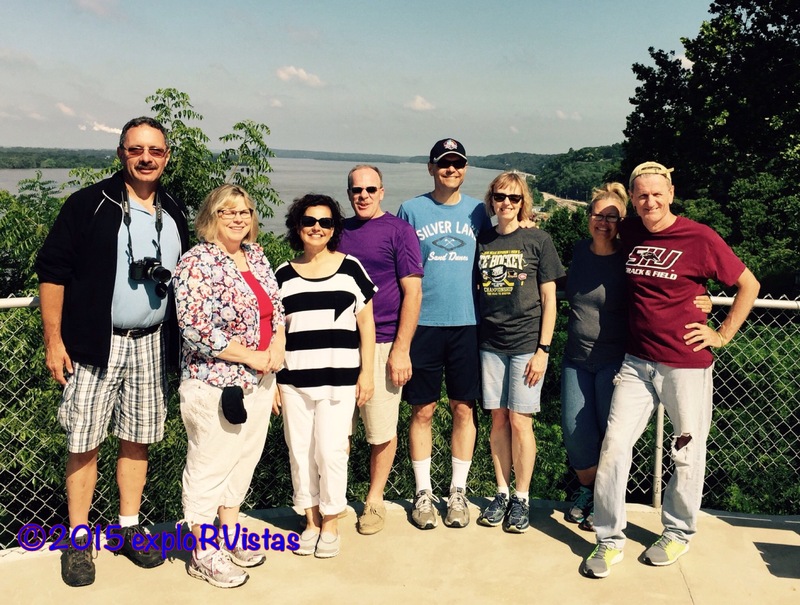 From left to right: Me and Diana, Karen and Bill from Livonia, Michigan, Paul and Sheryl from Kalamazoo, Michigan, and Sue and Jim from Alton. 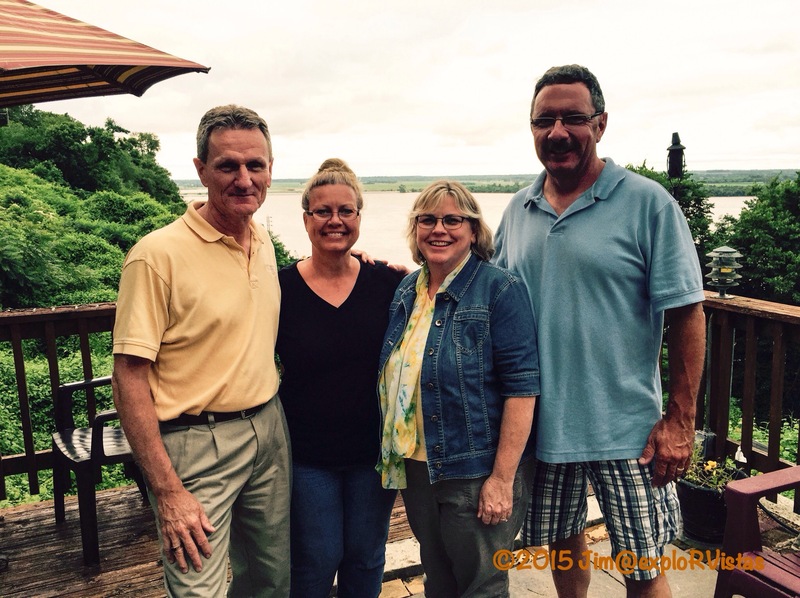 We missed Mike and Cindy from Kalamazoo and Scott and Jan from Rockford, Illinois, as they were unable to attend. With everyone’s busy schedules, it was quite an accomplishment to get a date that worked for eight of us. 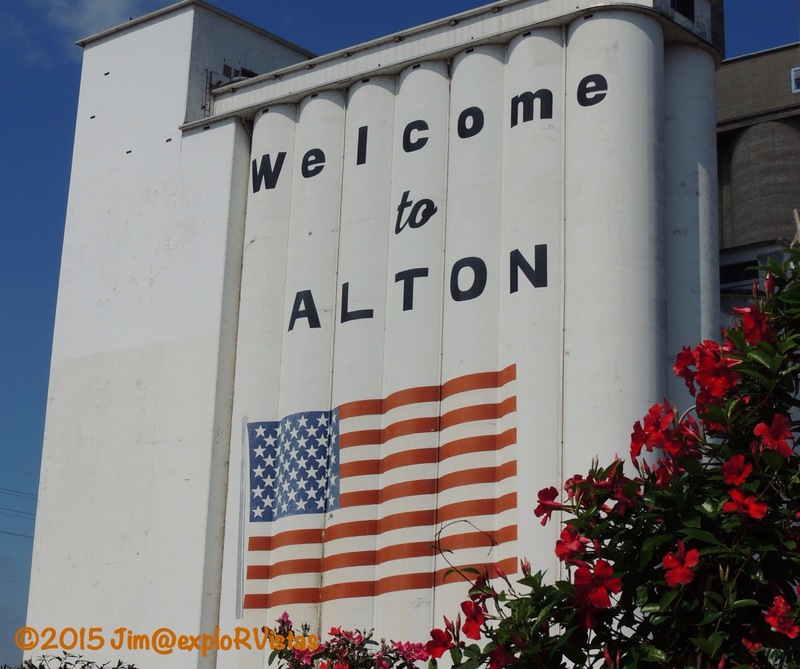 Downtown Alton offers the conveniences of a large city, yet retains the charm of the historical town it is. 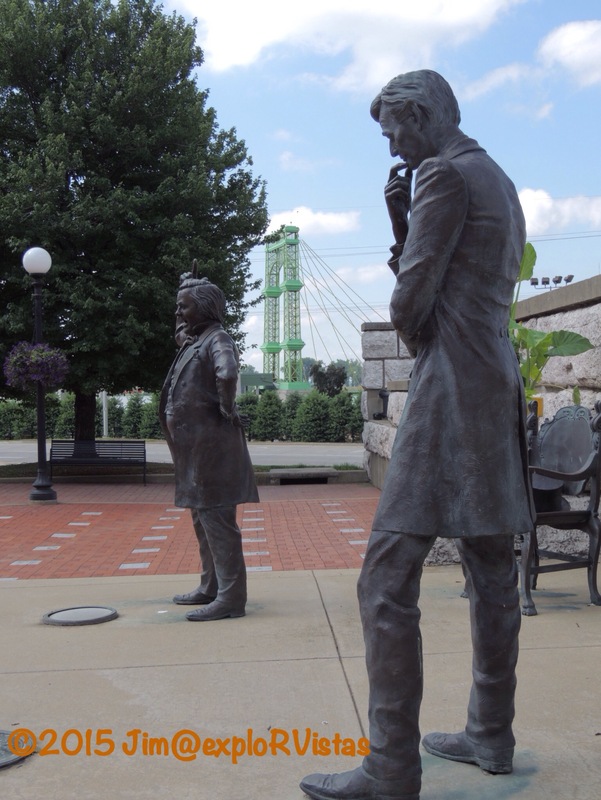 At Lincoln – Douglas Square, there are two bronze statues commemorating the last and most important of the seven debates of 1858 between Stephen Douglas and Abraham Lincoln for the Illinois Senate seat. The issue of slavery was the primary concern. While Lincoln ended up losing the election, the spotlight that was shone upon him after the debates ascended him to victory over Douglas for the U.S. Presidency two years later. 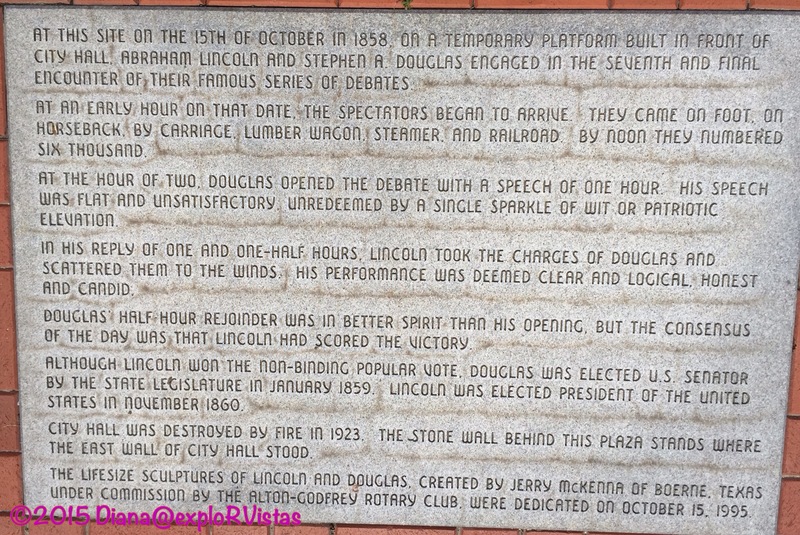 The plaque in the plaza explains the importance of the site. 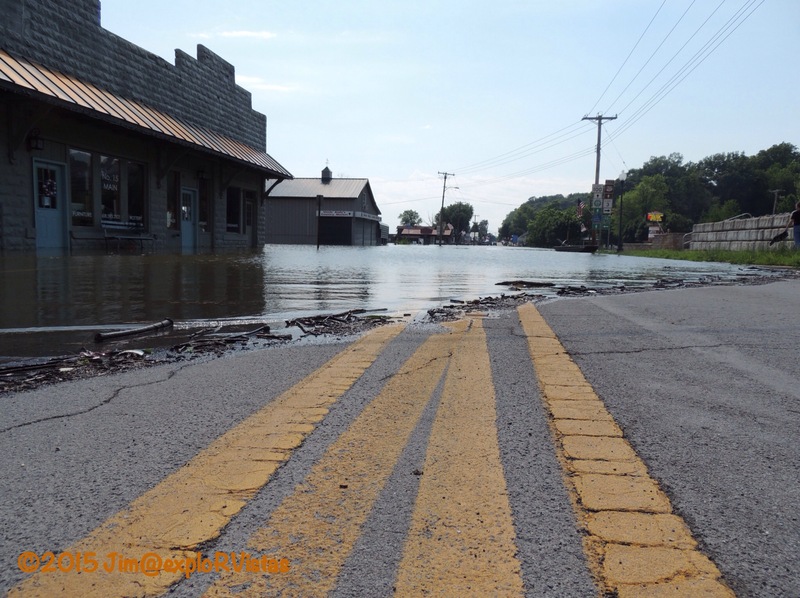 Another thing downtown Alton is known for is the flooding it endures from time to time. 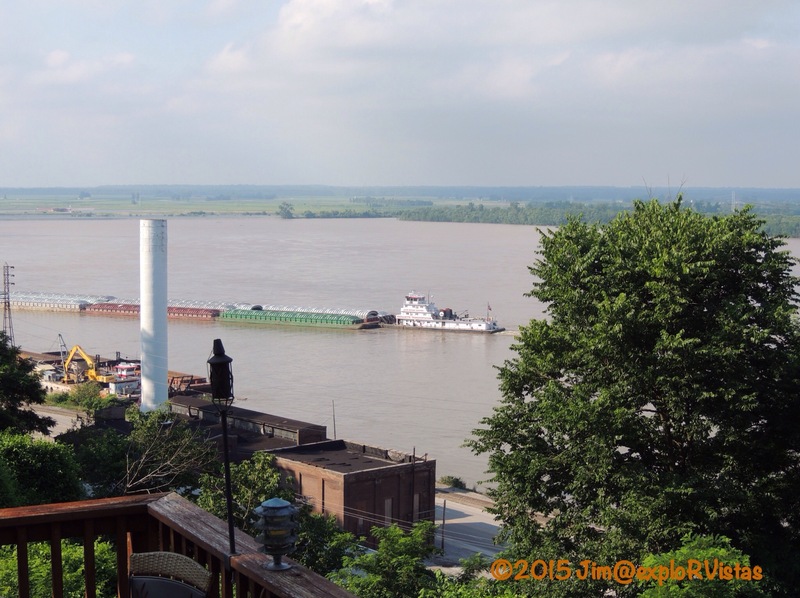 This year’s rains have swollen the Mississippi River to the brim. The businesses along the river are having to run pumps in their basements to remove the water. 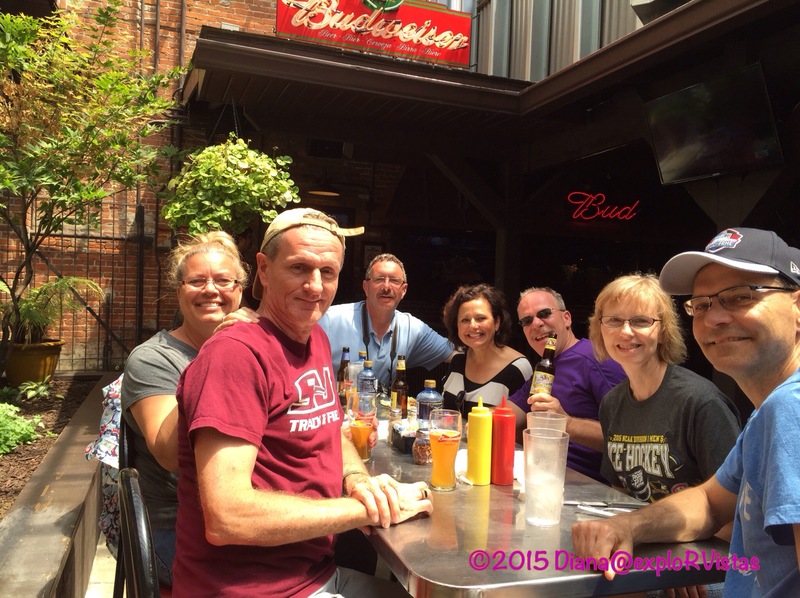 Along our walking tour, we stopped at Mac’s for lunch. They offered a large menu, and everyone was pleased with their meals. After lunch, we headed to see Jim and Sue’s youngest son play baseball. They were playing a double header. Jake is quite the accomplished baseball player. 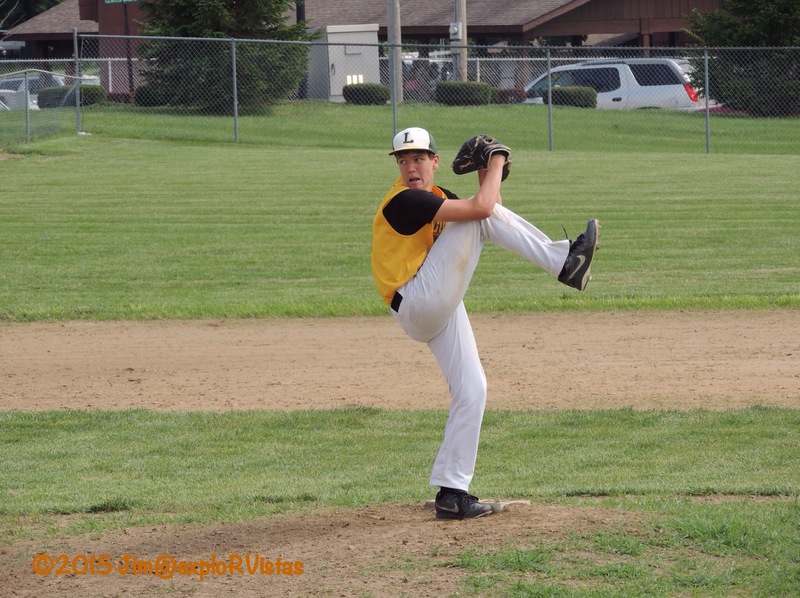 Though they lost the first game, Jake’s pitching, base running and hitting skills ended up making the difference in the second game, and propelled them to victory. All three of Jim and Sue’s children are athletic, and their daughter Jessica won the Illinois state track championship as a high school junior in the Division 1-A 200 meter dash. She currently runs for Southern Illinois University. Josh, their oldest, a multi-sport athlete and our godson, will be attending law school at SIU this fall. A special treat for me was realized on Friday when it dawned on me that I had seen my godson and godfather (Uncle Ed) on the same day. 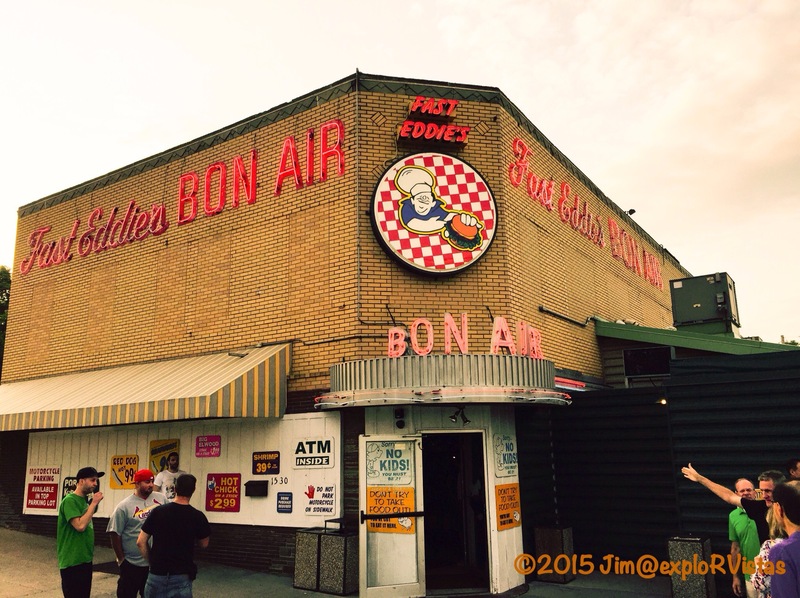 Later in the evening, we made the pilgrimage to Fast Eddie’s Bon Air, an Alton landmark. The watering hole was opened in 1921 by Anheuser Busch. It was sold ten years later to the Balaco family, who operated it for 50 years. Then, in 1981, Eddie Sholar bought the place and turned it into the establishment it is today. Up until recently, the 1/2 pound burgers were 99 cents. They are now $1.99. They also have steak kabobs, peel and eat shrimp and a few other items, all ridiculously cheap. When Illinois enacted an indoor smoking ban, Eddie bought the side street next to the bar from Alton and made an outdoor enclosed ‘patio’, complete with stage, additional bar space and water misters to keep the patrons cool. We had a really good time, although it was a bit loud and crowded. We have been there before in the middle of the afternoon and, while still lively, it is a little more our speed. The Bon Air is definitely the place to be in Alton. If you go, remember that it is cash only. It is a lot of fun! On Sunday morning, Karen, Bill, Sheryl, and Paul headed home. We stayed one more day, and took the opportunity to head up to Grafton along the Great River Road with Jim and Sue. The parkway runs alongside the eastern shore of the Mississippi River, and it features limestone bluffs that tower high above it. 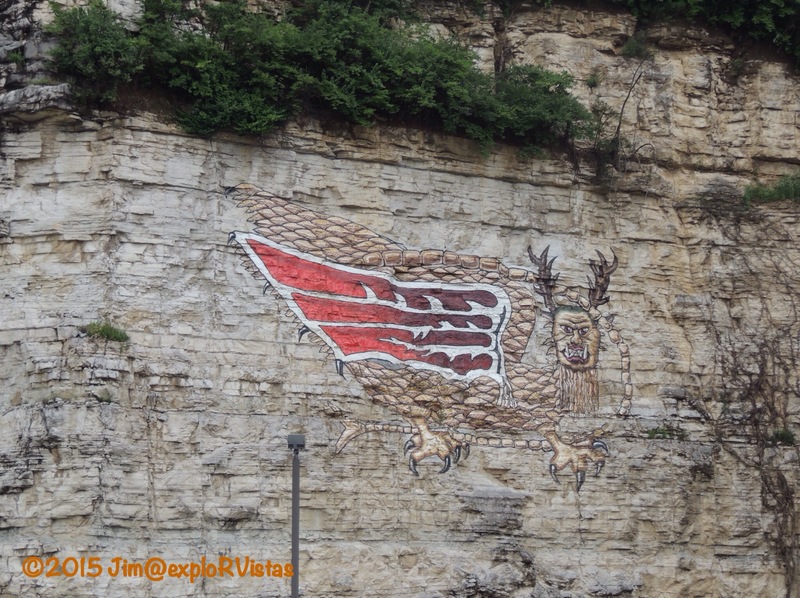 Just upstream from Jim and Sue’s house is a painting of the Piasa Bird, next to a cave in the bluff. The bird is an Illini Indian legend as a creature that would emerge from the caves and devour men. The painting was first recorded in 1673 by Father Jacques Marquette. Alton celebrates the legend and maintains the painting. It should be noted that the bluffs are frequented by vultures, as the updrafts created by them are favorable for soaring. We arrived in Grafton and found the southern half of town to be quite busy. There were many touristy shops open and doing quite well. The northern half of town was a bit different…. The Great River Road currently disappears into the Mississippi halfway through Grafton. The water was still rising, so this area is probably underwater now. 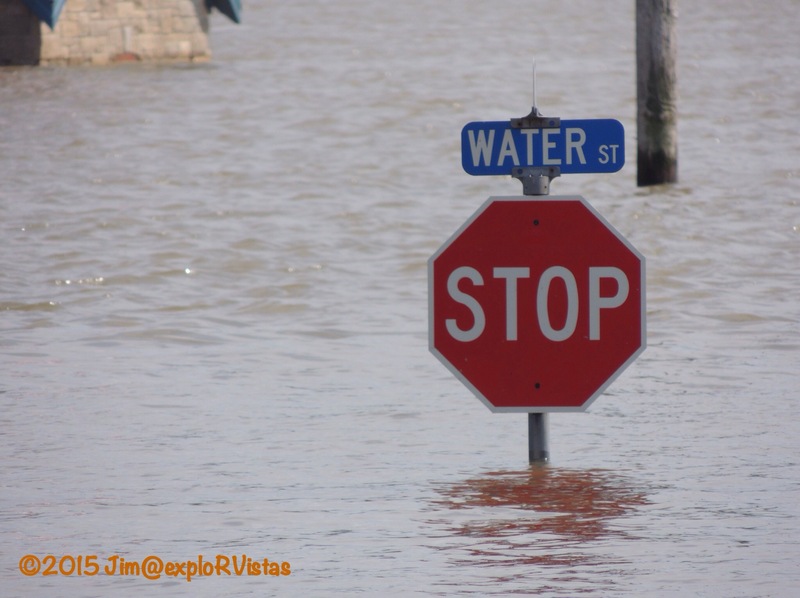 There are a number of streets that run between the main road and the river in Grafton, and they are obviously well under water. With that being said, Grafton is used to this, so they manage and thrive in this environment. 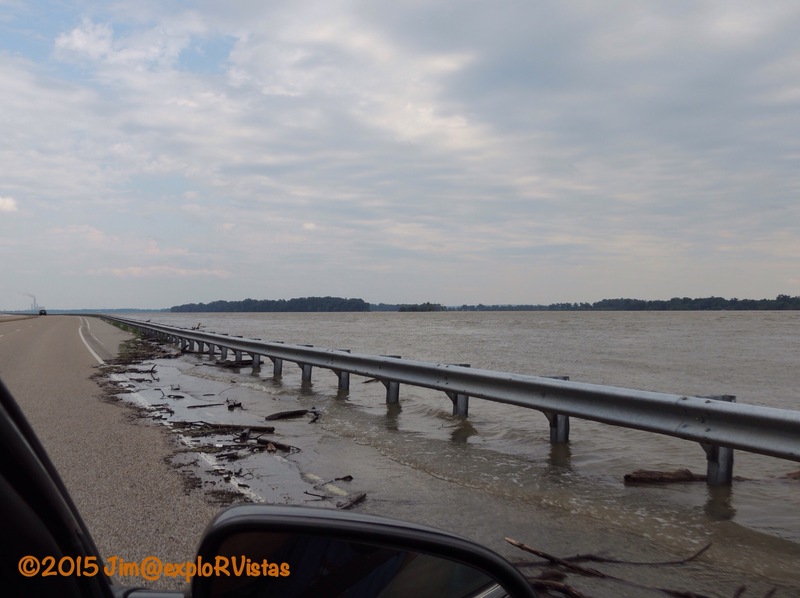 On the way back to Alton, I was able to get this photo of just how high the water was. There was a constant parade of uprooted trees flowing down the river, and at one point over the weekend, we saw someone’s dock and boat hoist float by. The flooding is nowhere near as bad as it was in 1993, but it is definitely causing some issues with the resident’s daily lives. So, what was the full time RVer’s rule we broke? That would be the 2-2-2 rule. No more than 200 miles a day, a 2 night minimum stay, and be off the road by 2 PM. Well, on Monday, we drove the entire route home in one day. A total of 592 miles! We were home at 9 PM, including the time we spent visiting Diana’s mom in Grand Rapids. I am fairly certain that is the longest day we have ever driven since we were married in 1982. Needless to say, our Sleep Number bed felt pretty good that night! Not sure how official it is, but I like the 2-2-2 rule. I have yet to ever follow that as a non-RVer. Once you retire, Shannon, it is a great rule to follow! 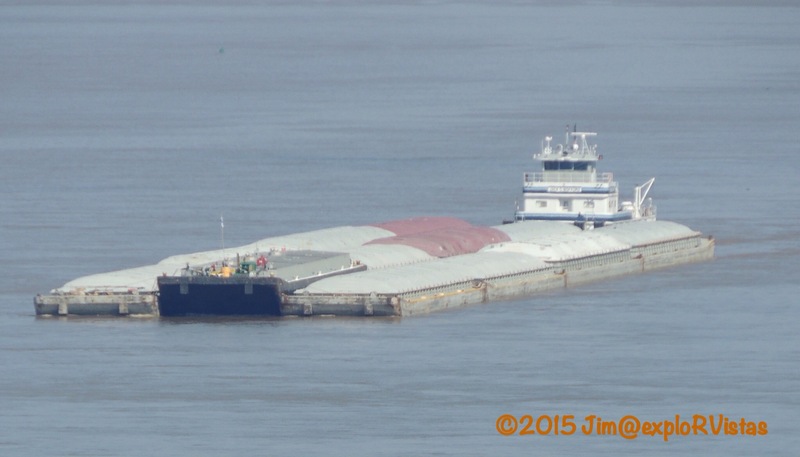 We watched those same barges and trees flowing down the Mississippi from our park in West Memphis!! The river was suppose to be at 30.5 ft by Tuesday. They evacuate the RV park at 31 ft since it sits right on the side of the river. Luckily, we were long gone on Monday:) What a great time with friends. Boy, that house is magnificent!!! It really is, Pam! Jim and Sue really landed a gem with the purchase of that home. Isn’t the Mississippi something? There is a lot of power in that river. Where are you headed next? We are presently in Atlanta visiting our son. We head to Gaffney, SC for a routine maintance check, then we are off to PA to see our daughter and northern NY to see my mother. We’ll head west around mid August. We aren’t sure which route we’ll take to head west. We’ll be leaving from southern PA. Sounds like a great trip. We are looking forward to seeing the southern Mississippi this Winter. It really was, Bonnie :). Have fun down there this winter! Looks like a great trip, stunning photos and more touring than I could handle. Glad you guys got away for a little R&R. Water levels here at Thomson, and previously at Grant River are about normal. Lower than some years, higher than some, but OK — I think you were getting water from further west as the Mississippi gathers water from various watersheds. Thanks, Peter! We definitely had a great time! Oh you were really lucky. i remembered being stuck around chicago when we were trying to go back to the airport after our road trip around lake Michigan. Was really really bad. That is usually the case, Gin. We’ve been by their at least twenty times over the years, and this was the first time we didn’t get caught in traffic.